Identify Diagnostics Cotinine / Nicotine Drug Test Dip - 200 ng/mL Results in minutes. Model # ID-COT-DIP. Available in packs of 5, 10, 15, 25, or 50 dips. Buy more and save more. IMPORTANT: For frequent heavy smokers, this test may present a preliminary POSITIVE result in excess of 21 DAYS after the last nicotine usage. This can vary from person to person depending on body type, frequency of use, metabolism, and tobacco usage method. Very infrequent smokers may test negative less than 24 hours after light nicotine use. This test is designed to detect cotinine in human urine when it meets or exceeds 200 ng/mL. Cotinine is the byproduct of nicotine after it has been metabolized by the human body. PLEASE NOTE: Subjects exposed to secondhand smoke, but do not use tobacco products, typically have a cotinine level no higher than 20-30 ng/mL. Subjects using nicotine patches or nicotine gum may test positive with this urine test. Identify Diagnostics drug test dips were created with quality, accuracy, & price as key features. 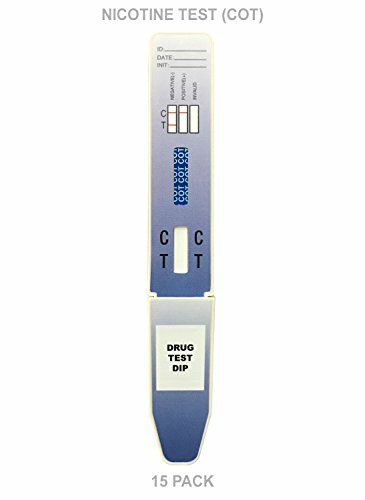 This 1 panel dip test is one of several available versions trusted by medical professionals & home drug testers across the United States. Please Note: Urine collection cups not included. This test is Forensic Use Only. It is not intended for medical or diagnostic use. For heavy smokers this nicotine test is capable of presenting a POSITIVE result 2-3 WEEKS after last nicotine usage. Negative test results usually appear in under 4 days for moderate to less frequent nicotine users. REMOVE CAP BEFORE DIPPING, dip in urine for 15 seconds. 2 lines appear if negative, 1 line if positive. Do not dip past black wavy lines. Over 99% Accuracy detecting Nicotine / Cotinine (COT) in urine at the listed cut-off level of 200 ng/mL or greater. Ideal for detecting nicotine exposure due to smoking cigarettes, chewing tobacco, vaping, and more. If you have any questions about this product by Identify Diagnostics, contact us by completing and submitting the form below. If you are looking for a specif part number, please include it with your message.